Two key economic aspects most individuals focus on our jobs and wages. 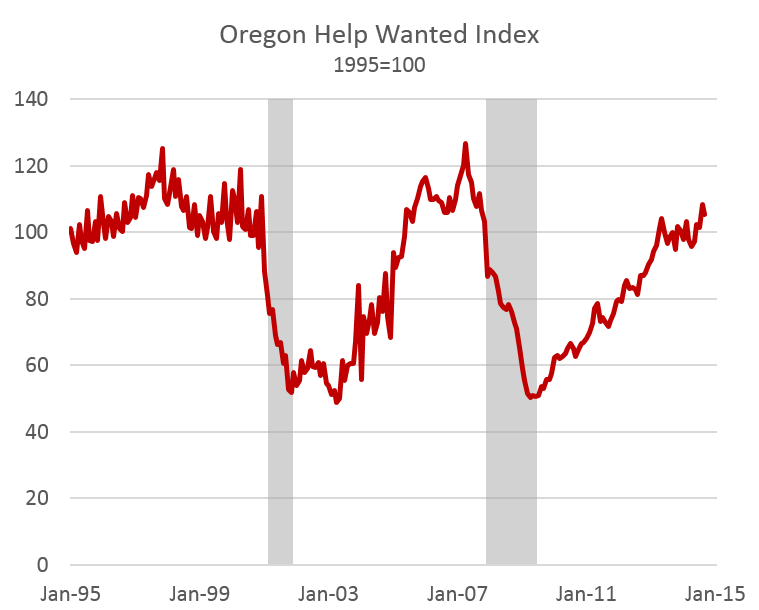 So far we’ve seen job growth accelerate in Oregon but wages have typically advanced only at the rate of inflation. So a lot more Oregonians have jobs, but their wages have not really gone up much. In terms of leading indicators, one of the best ones is the initial claims for unemployment insurance. This is a great indicator of the firing rate, or layoff rate. However, layoffs have not been an economic issue in a few years now. The issue has been the hiring rate, or the pace at which firms add employees. Even with the acceleration in Oregon, job growth is still below the typical expansion the state is accustomed to. In terms of leading indicators for hiring, one measure our office uses is the number of help wanted ads. Theoretically (and usually in practice) businesses advertise that they are hiring before they actually hire. So, how many help wanted ads are there? Using a relatively new methodology (documented here) that combines historical newspaper data with modern online ads data, here is an update. This likely bodes well for future economic and employment growth. Much of the recessionary losses have been regained. However, one potential issue economists have debated at the national level, is that job openings have increased substantially faster than actual hires. See Calculated Risk for the most recent graph. Some argue this is a sign of structural unemployment and a skill mismatch between available workers and what businesses want or need. It sounds reasonable and there is always some level of structural unemployment in the economy. However if you dig into the job vacancy survey data, as our office did recently, it really indicates that structural unemployment is not the major issue today. Lastly, I forgot to post an update here on the blog for the leading indicators with our most recent quarterly forecast. 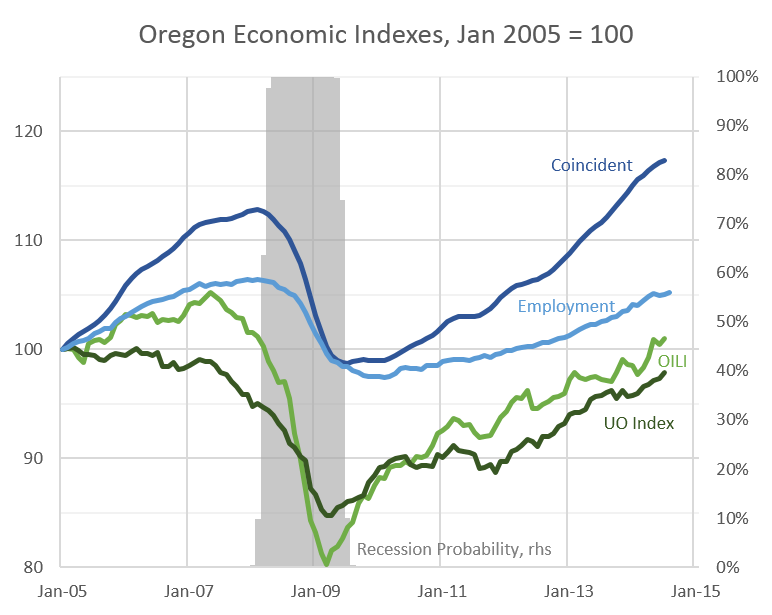 A more complete write-up is available in our forecast document, as it always is, but here is an updated graph showing both our office’s Oregon Index of Leading Indicators (OILI) and the University of Oregon one as well.